These important IMechE conference transactions identify the good and bad things about industry behaviour in new train provision; things that have caused frustration within both government and industry alike. Through a wide selection of papers, New Trains seeks to highlight and explore the challenges and solutions facing the industry today. New Trains focuses on the design, new train introduction, maintenance, and developing technologies. This volume contains technical papers from experts in industry who have first-hand experience of what works and, when it doesn't, how to put it right. 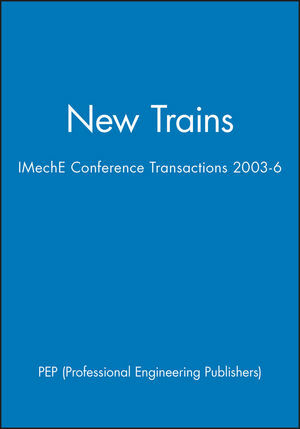 PEP - Professional Engineering Publishers - is the author of New Trains: IMechE Conference Transactions 2003-6, published by Wiley. The complications of systems engineering a new train. Designed for life - first cost or life cycle. The value of test facilities during new train introduction. The role of a central maintenance depot and maintenance at outstations for a new train fleet. The train operator's view of new train introduction. Putting together a maintenance schedule for a new train. New trains on existing tracks - managing the inevitable.